Pastor Marlan is amazing -- OK, so I'm his wife, Sylvia -- and I love his sermons! And I know I'm not the only one who is blessed by them. I've heard from many people who enjoy his passionate, "you-are-there" style of Bible-based teaching, and who wish that his sermon audios were more readily available. That's why we've created PastorMarlanSermons.com - just for you! In time, we hope to have all of Pastor Marlan's sermons here, in one easy-to-access location. You can download, listen to streaming audio, or podcast! It is our prayer that you will be blessed with growth and transformation as you contemplate God's thoughts for you through His Word. Pastor Marlan is a native Californian of German, Jewish and Italian heritage. Some of his early childhood memories include exploring underneath pews, and testing trajectories of spring-loaded pens, during church service at the Ukiah Seventh-Day Adventist Church. He also remembers helping his father on their small farm outside of Ukiah, learning many practical skills that have come in handy throughout his life. He was called to pastoral ministry during his sophomore year as an Accounting major at Pacific Union College. Since receiving his Master of Divinity from Andrews University in 1987, he has pastored in Oildale, Taft, Santa Cruz, Soquel, Bakersfield, and Hollister. He is currently taking time off from ministry due to health challenges. Pastor Marlan is passionate about Bible teaching, helping people understand the evidence for the unique teachings we have, and seeing people grow in small group settings and become active in ministry. His dream is for Sabbath School teachers to become proficient in teaching the Word so people will be excited about attending Sabbath School! 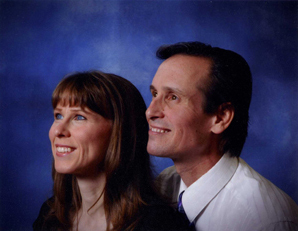 Pastor Marlan's ministry became a team effort when we married in 2010! Outside of ministry, we enjoy road trips, camping, bird-watching, kayaking, hiking, tennis, reading, trying new ethnic foods, and spending time with family and friends. We've posted our contact information on the "Contact Us" page, so you can drop us a line if you're so inclined! We'd love to hear from you!